As haute couture for cuisines, quite a number of restaurants on the island represent the very best in quality, innovation, technique and presentation; what goes into each dish is more than food. That said, for food enthusiasts these restaurants are not something to be taken lightly as they represent the definition of their culture, based on the newfound pleasure of conviviality, the hunt and curiosity for new tastes. But before you continue reading, note that some of the restaurants we list in this story have a strict dress code and require reservations. 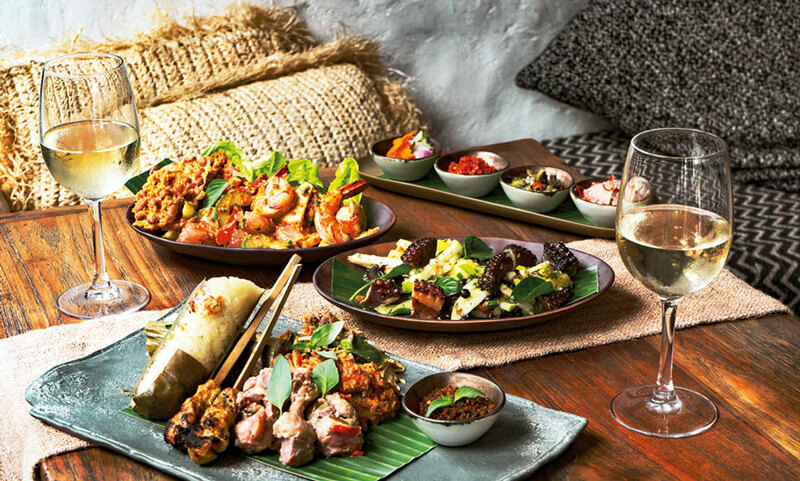 Bali is home to some of the finest restaurants in Asia. From succulent steaks at the restaurants in the Bukit area to superior seafood in Nusa Dua, the fine creations of haute cuisine in Ubud to the glamorous tastes of Seminyak, you can certainly spoil yourself at these top tables during your time in Bali. In Ubud, Kubu at Mandapa has been playing host to international gourmands and celebrities in its private cocoons that overlook the island’s sacredAyungRiver. 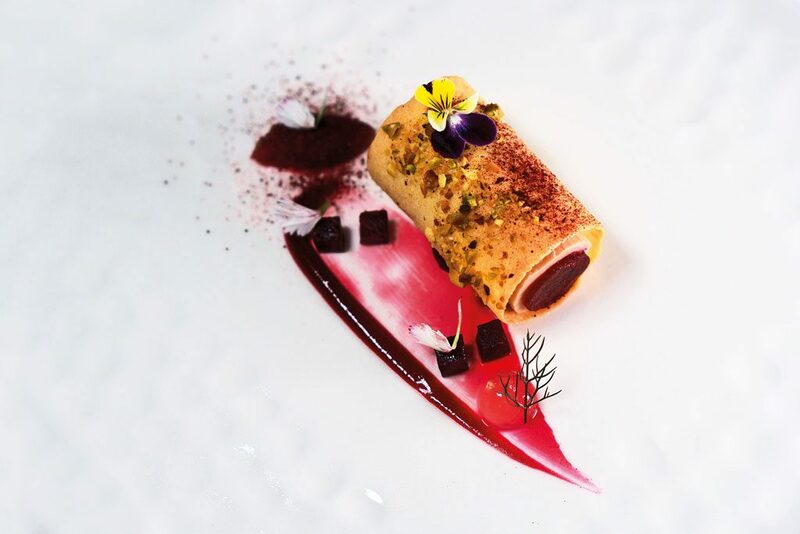 At this fine dining establishment you are spoilt with fine Mediterranean-European cuisine, with the choice to enjoy either a sophisticated a-la-carte options or specially tailored degustation menus. Kubu’s recent, tailored set menu, aptly named “The Gourmet”, sees a series of fine creations by the restaurant’s award-winning kitchen team. Chef’s Collection will be delivered to your table to kick off your delectable feast from this menu, followed by Foie Gras Parfait Beetroot and Hamachi (cucumber, ginger, lemon, jalapeño). Lining up next are Ravioli with Boston lobster, Gambero d’ Argentine with prawn truffle mousse, and Wagyu Beef Short Ribs. To conclude the dining experience, you will indulge in Blood Orange Chocolate Fondant and Petits Fours. A 10-minute drive from Kubu is Apéritif, the latest addition to the island’s fine dining scene, set amid a lush jungle valley setting. Combining the highest quality ingredients from their own greenhouse as well across Bali and around the world, Apéritif presents the best of contemporary global cuisine touching on the archipelago’s diverse culinary heritage and ingredients. 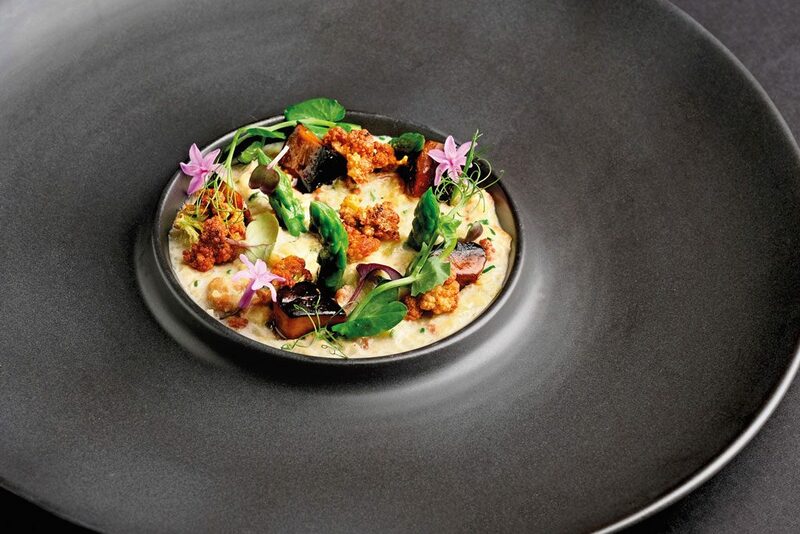 The restaurant’s sophisticated, eight-course degustation menu presents an unrivalled culinary journey that brings together the flavours of modern gastronomy, lesser-known Indonesian ingredients, and exquisite produce sourced globally, in addition to the property’s own greenhouse harvest. Apéritif’s Belgian Executive Chef NicVanderbeeken takes culinary influences from the old Spice Islands and combines it with distinctly modern European flavours and cooking techniques, presenting splendid creations that breathe finesse such as Smoked Oyster Emulsion served with spirulina and seaweed, Tomato Tart, and Canadian Lobster served with caviar and parsnip. Still in Ubud, tucked silently under the entrance bridge of DesaVisesa, a fine dining pesco-vegetarian menu is introduced to Bali at Padi. The Indonesian word for “rice”, Padi boasts a cozy yet sophisticated atmosphere, centred mainly around tables of two, with a chef’s table also on offer. While many scoff at the idea of even attempting to create fine dining without allowing animal protein to play centre stage, Padi stands poised to dazzle such skeptics, vegetarians and pesco-vegetarians alike, with dishes likely to form life-long gustatory memories. Chef Dedi’s unending search for garden goodness as ingredients in his latest creative inclinations, here you will be tempted by a 3 and 5-course vegetarian or pescatarian menu for lunch, meanwhile for dinner you will be tempted to try one of the two daily table d’hôte 7 and 9 course pescatarian or vegetarian menus. Some highlights are the Butter Poached Bay Rock Lobster, Agnolotti Sweet Corn Truffle, Cauliflower Risotto and Crusted Day Caught Snapper. In Payangan, The Kelusa is a dining gem that boasts an innovative menu of fine-quality ingredients, highlighting the best local produce to satisfy even the most discerning foodie. Under the wings of Chef IwanSutrisno, diners at the restaurant are treated to gourmet dishes which celebrate the rich and diverse culinary history of Balinese and Indonesian food. The Kelusa dinner is a treat with a parade of delectable starters, exquisite main courses and a decadent array of desserts. To start, order the ‘Betutu Cannelloni’ (spiced ‘betutu’ chicken, tomato ragout, burnt mozzarella, chilli lemongrass vinaigrette). For mains, sample Chef Iwan’s speciality, ‘BuntutStrozzapreti’ (homemade twisted pasta, pulled oxtail, nutmeg, Grana Padano, local celery, beef au jus). To finish, treat yourself to the ‘LemongrassPannacotta’ (candied ginger, Asian berries, shortbread, passion fruit coulis, and fresh mint). From the hills of Ubud and Payangan to the cliffs of Ungasan, the stylish and über-chic Ju-Ma-Na at the Banyan Tree Ungasan enlivens your taste buds with its avant-garde menu that comprises stunning French cuisine with a Japanese twist. The immaculate fine dining cliff-top restaurant — complete with a stylish shisha bar, lounge, and an exceptional wine cellar — is intended to create an unparalleled gourmet experience in a glamorous setting. Meaning “white pearl” in Arabic, Ju-Ma-Na is shaped like a rounded pearl with white interiors and exteriors dominating the restaurant’s décor. It’s a fine restaurant indeed, but Ju-Ma-Na also makes for an excellent venue for watching the sunset while enjoying the numerous mixes of cocktails on offer. The restaurant’s cosmopolitan cocktails and aperitifs as well as Arabian-influenced snacks and drinks complement the menu that lists gourmet creations based on fresh seafood, meat and vegetarian choices. And as a prelude to your meal, you will invited to wash your hands in a beautiful golden bowl filled with pearls. It is indeed a lovely little cleansing ceremony. In Sawangan, Nusa Dua, you will find the charming ambiance of Bali at Crystal Blue Restaurant, nestled inside Samabe Bali Suites & Villas. Whether creating a full evening of fine dining or slipping away for a few hours of simple relaxation with friends, the atmosphere of this exceptional destination allows you to design your own escape. 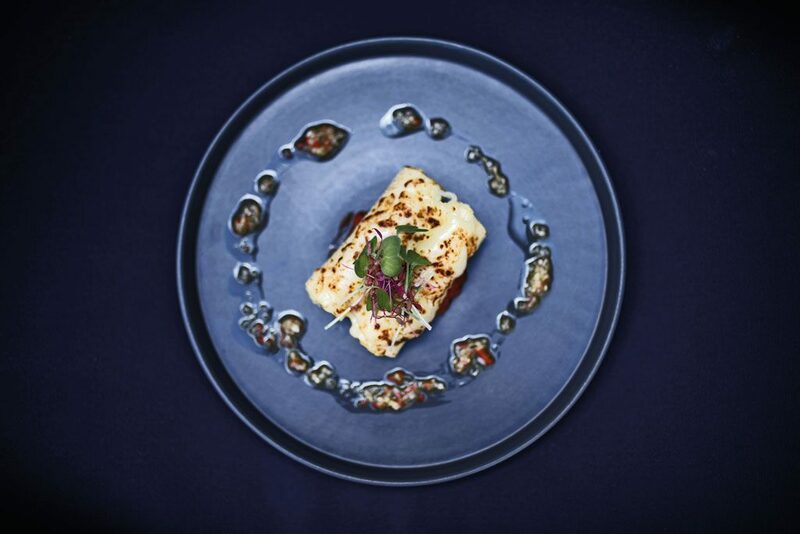 The restaurant features fresh dishes, which consist of locally sourced ingredients typical of Mediterranean cuisine. For starters you can please your taste buds with tropical Prawn & Quinoa. 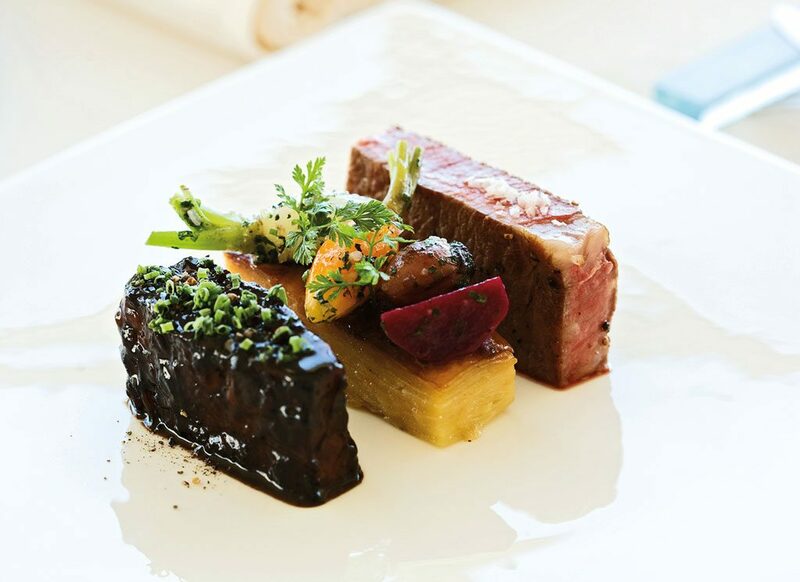 With a knack for marrying authenticity and the finest ingredients, you will be spoilt for choice with Crystal Blue’s exemplary list of mains including the Australian Beef Tenderloin or Beef and Lamb Fillet. Alternatively, you can savour the Hot Stones Experience, which comes with grilled sweet corn, baked potatoes and a choice of sauces. A 5-minute drive from Crystal Blue Restaurant is an award-winning dining establishment that has received international accolades, Kayuputi. The signature restaurant of The St. Regis Bali Resort, Kayuputi has received prestigious awards from the Wine Spectator Magazine (USA) and dubbed as a fine restaurant that has one of the best wine lists in the Asian region. This beachfront fine-dining restaurant is elegantly dressed in immaculate linens and perfectly polished tableware to sync with the restaurant’s modern décor and its sophisticated ambience. The material of choice used throughout the restaurant is living up to its name, which means ‘white wood’. You may reserve private cabanas for dining, or opt to settle into a soft white cushion inside the high-ceiling restaurant where the two-storey wine cellar and open kitchen add to the ambience. The restaurant’s sommelier is pleased to consult with you on wine selections. 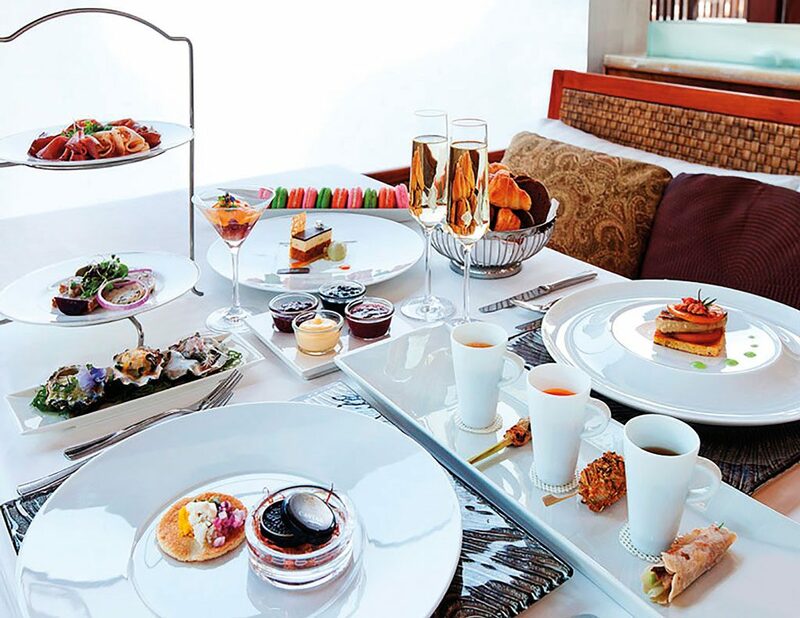 The restaurant’s Champagne brunch, known as the Astor Diamond Champagne Brunch, is a classic weekend affair that brings high society into a new realm. The offerings showcase the finest Asian inspired haute cuisine, in a style that is unprecedented both in opulence and exclusivity. In posh of Seminyak, an exclusive gastronomic experience with impeccable culinary creations and elegant atmosphere is served at MÉTIS. This legendary dining establishment, having been welcoming the most stylish diners on the island, offers an excellent interpretation of classic French cuisines with a Mediterranean twist within lush tropical garden. At the helm of the kitchen are chef-owner Doudou and Executive Chef Dove, and with extensive years of experience, together they collaborate and share inspirations, knowledge, cooking techniques and methods with the whole team to ensure a high standard in every aspect and deliver the most exquisite culinary adventure to aficionados. 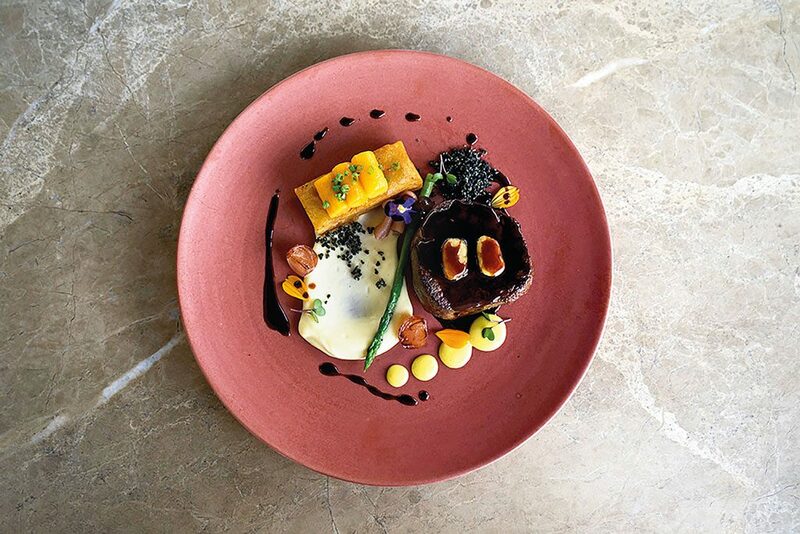 The never-ending commitment in pairing fine dining and fine art in Bali has made MÉTIS an icon in the Bali fine dining scene. As a result, numerous international acclaims have been received over the last few years including a Wine Spectator Award of Excellence and inclusion in Asia’s top 20 restaurants in the Miele Guide Best of Asia, 2013. 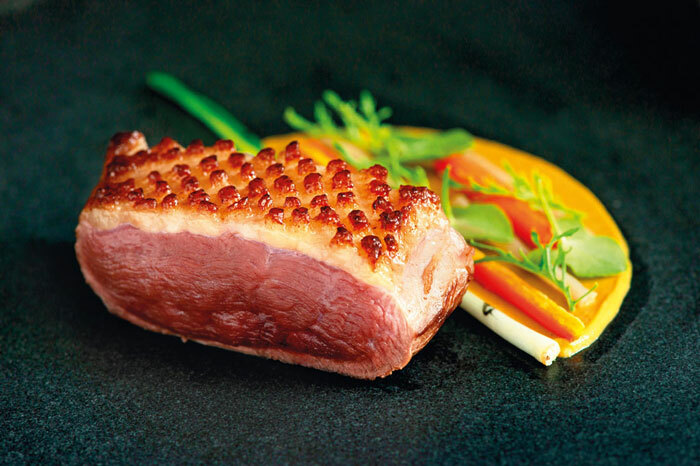 The menus are divided into starters, soups and pastas, meat and poultry, fish and seafood, and desserts, with our favourites that you also must try being the Seafood Linguine, the 14-hour Crispy Skin Pork Belly, and Moulard Duck Leg Confit. 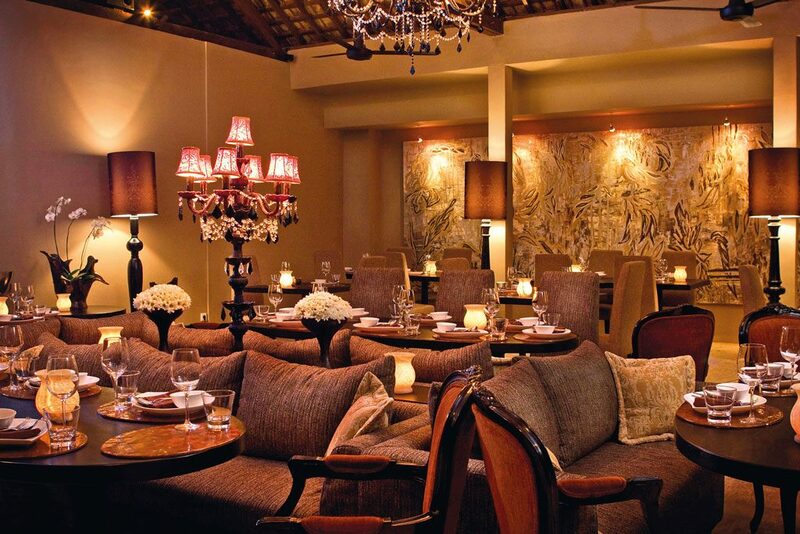 A Bali legend in Seminyak is Sarong, created by one of the most renowned and respected culinary greats, Will Meyrick. 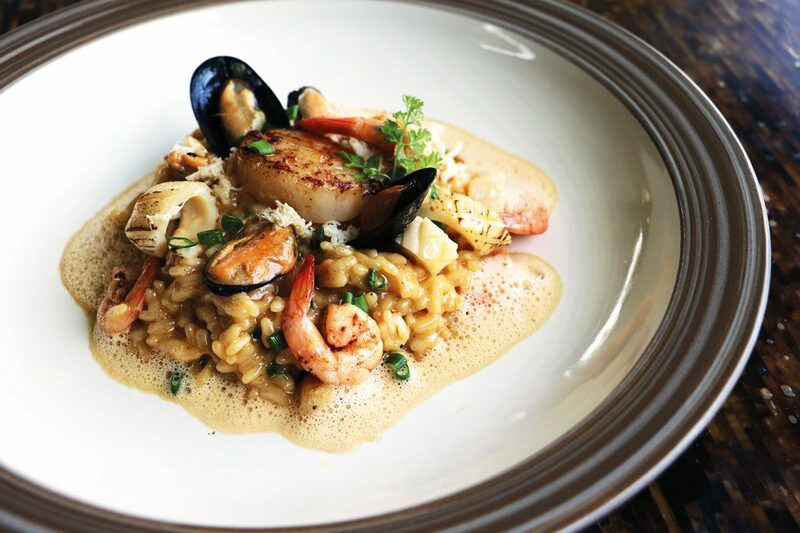 It’s simply startling to many how the food at Sarong has become a passion, an obsession. Certainly it’s a description that goes a little over the top, but in all aspects so does Sarong. Over the years Will Meyrick and his team at Sarong have built on their fine reputation for the provision of ingeniously simple, authentic Asian cuisine in a high class dining style that echoes the indulgence of the Raj as each dish, so elegantly presented, is described and served to the table. 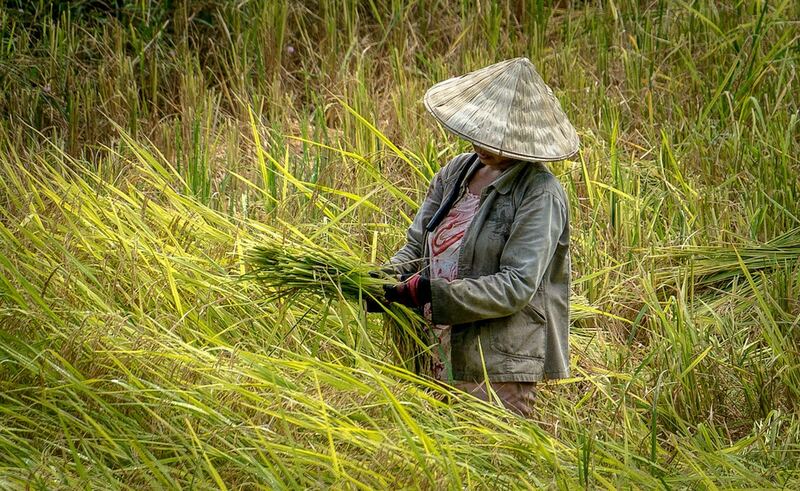 Another aspect that is part of Sarong’s secret to longevity and success is the frequency with which the menu is complemented by results of travel and adventure. This is not the work of a chef who decides to open another recipe book for more ideas, this is the kitchen of a team who have been led on adventures to far flung lands by their executive chef, Will Meyrick. Alongside this adventuring on the menu, favourite dishes never seem to fall out of favour, it would be hard to imagine turning up to Sarong and not finding your favourite Pork Belly with Tamarind and Tamarillo or the world famous Butter Chicken, or heaven forbid, that the divine Indian themed Pavlova festooned with the sweetest of rose petals should disappear off the menu.